Two years ago when I started this blog and began researching local food options in my area, I was blessed to meet John. He lives down the road a little ways from my house. For a few blissful seasons, I helped him plant tomatoes, potatoes, asparagus, and strawberries and then harvest those beauties plus many others. His backyard is the equivalent of a small farm–he even has chickens! I’m pleased to say that he is open for business this year after a brief hiatus. Just follow the signs you see on Old County Road in Newark. Here’s a piece I wrote about John a couple years ago. He’s still an inspiration! 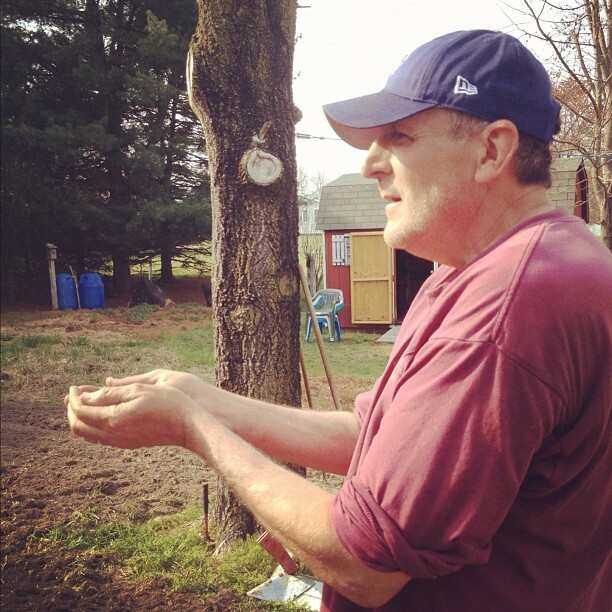 John was kind enough to take a break from potato and asparagus planting to show me around his garden. He has two generously sized plots. 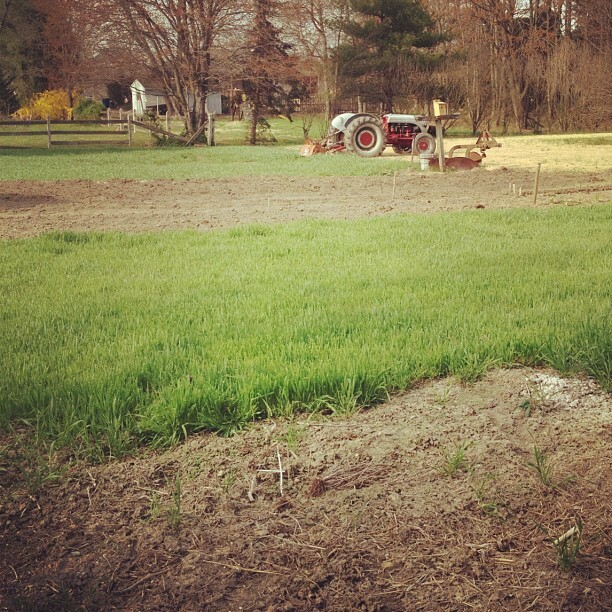 Part of one was tilled with potatoes, carrots, broccoli and snap peas already planted; the other parts still bright green with crop cover, waiting to be planted later this spring. Part of John’s garden. Notice the beautiful green of the crop cover. When I asked John how long he’s been gardening, he said, “Well, I guess since we bought the house in 1975. Yes, that was ’75,” he said with a grin. 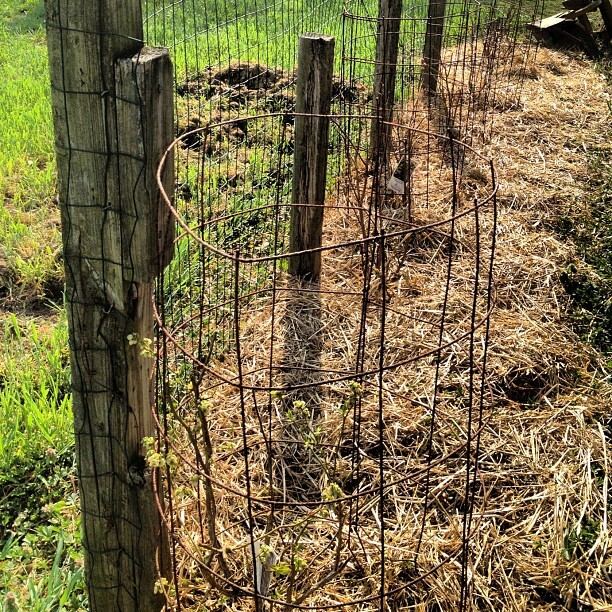 The soil was in rough shape when he arrived, and he’s put a lot of work into making it suitable for growing things. 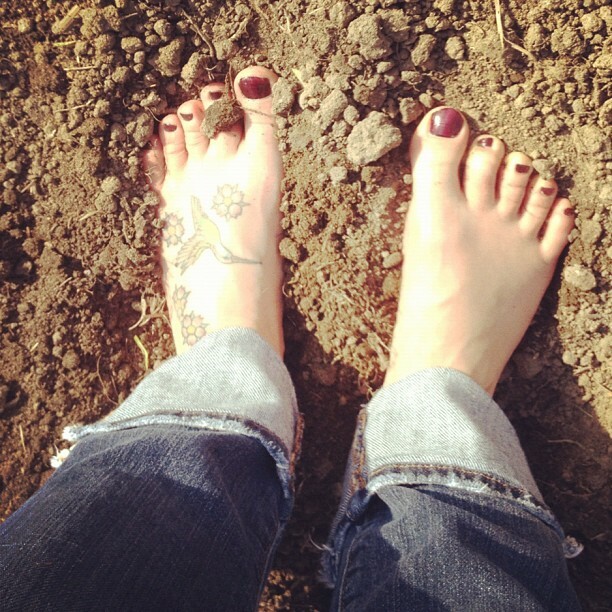 When I stuck my feet into the soil, it felt soft and rich, perfect for little roots to grow. My flat and square “Fred Flinstone” feet getting happy in the lovely soil of John’s garden. John and I sat at the picnic table near his deck and surveyed the back yard. 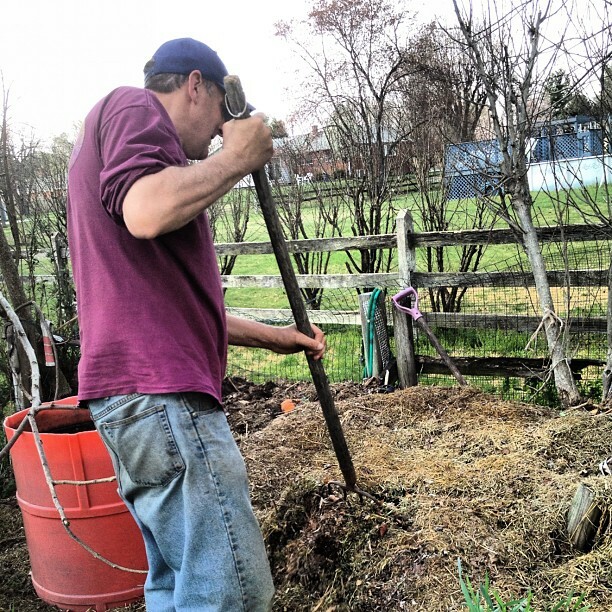 He pointed out the leaves he bags throughout the year to add to the soil, the nutrient-adding crop cover, and his wife’s flower beds. From my point of view, that one back yard looked like a full-time job. “Is it worth it?” I asked. “Well…I’ve been doing it for so long. The hardest part is maintaining the produce stand out front. I have to be here to make change.” One reason it’s worth the effort are the donations he makes to the Food Bank of Delaware. I talked to Jim Weir, the Operations Director of the Newark branch. Jim knew John right away, saying John makes a donation every single week, which adds up to over 2,000 pounds of fresh produce each growing season–all donated to those that need it most. Worth it, indeed. 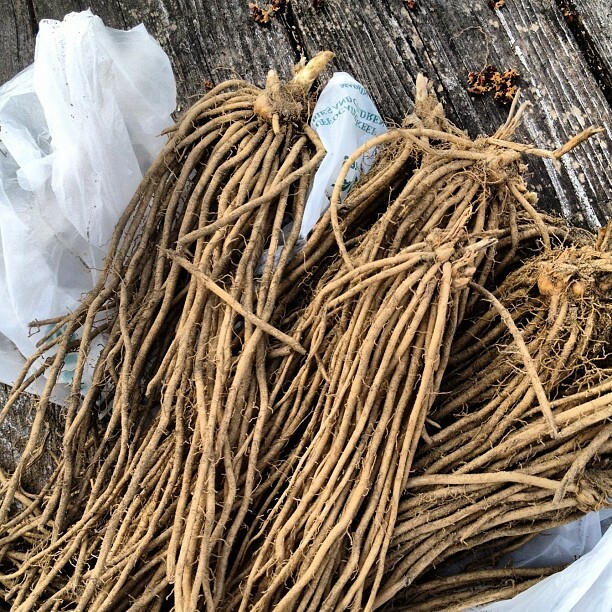 John showed me his asparagus plants, being careful to remind me that asparagus takes a while. “There won’t be any at the stand this year, but maybe next year,” he said. I’ve never seen asparagus plants before; they didn’t look impressive. John wanted me to know that he’s only growing the asparagus for his wife. “I don’t care for it,” he said. “Or for those little cabbage things.” I assured him that both asparagus and brussel sprouts (the little cabbage things) are excellent when roasted in the oven. He didn’t believe me. 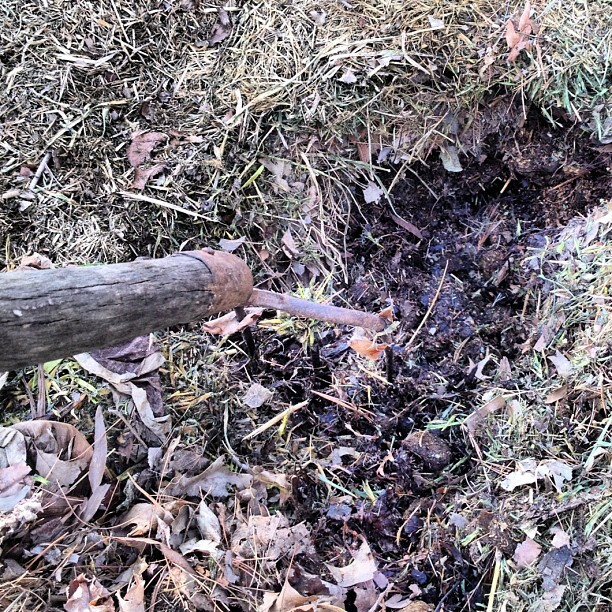 Walking a circle around his backyard, John and I ended up at the compost heap. I told him I always hate to throw away my coffee grounds, egg shells and potato peels, but without a garden I don’t have much use for a compost bin. We struck a deal, and now I’m saving my scraps for his compost. I’m excited to contribute, even in this little way! In an effort to contribute even more, I offered to help him with the planting anytime. “How about right now?” Before I knew it, John put a hoe in my hand, and I was covering seed potatoes with the dark, rich soil. 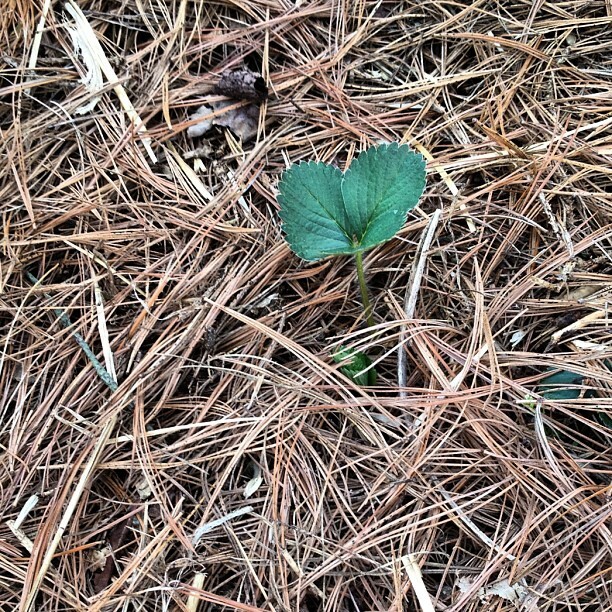 After the potatoes were covered, John showed me the strawberry plants. 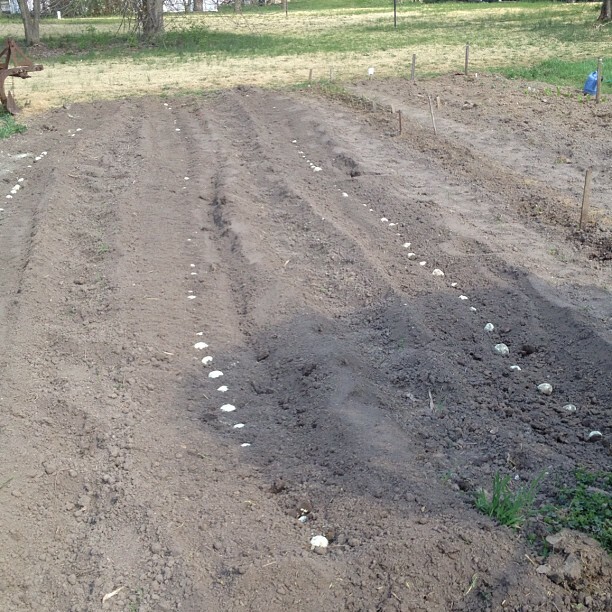 He’s planting 75 new plants this year, right next to the asparagus plot. The blueberry bushes are growing too. He’s hoping to pick more than a handful this year! John said the dirt is less clay-like and clumpy than before, but it required a lot of work! 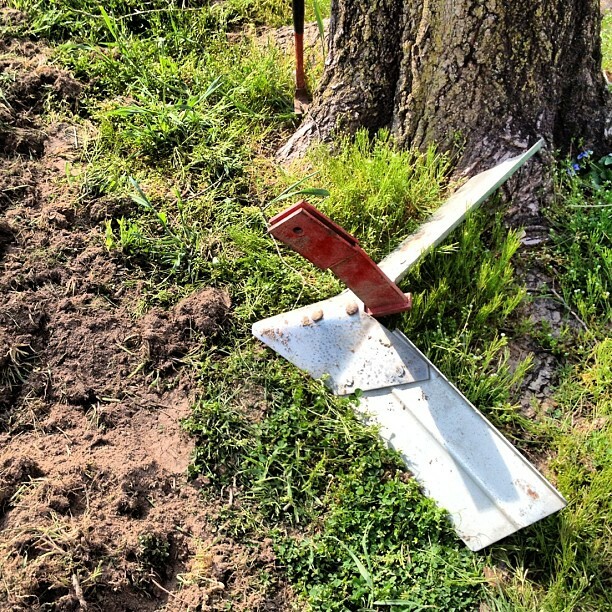 I wanted to stay and help John with those furrows, but I had to go. As we were walking to the driveway, a neighbor shouted over, “Do you have an apprentice over there, John?” John waved, nodded and said, “She’s a good learner, and I’ve got to teach someone how to do this so I can retire.” I’m an eager learner, at least. Before I left, John ran into the house to get me an unexpected gift–homemade black raspberry jelly. 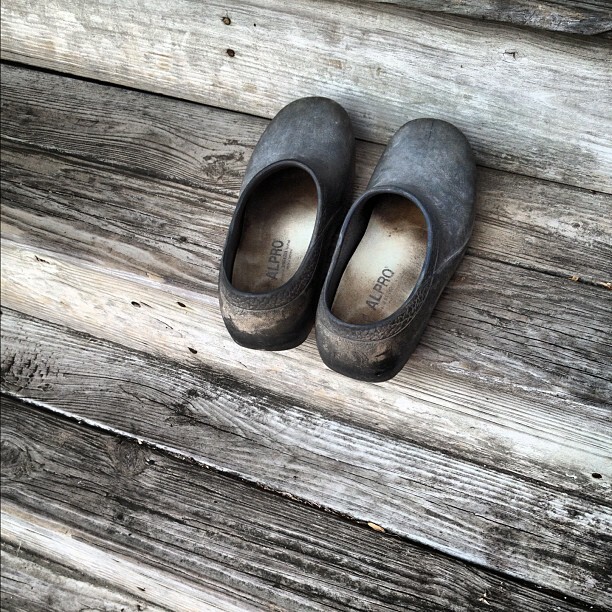 I spied his gardening shoes, covered with dust, and looking picturesque on the wooden steps. Who needs shoes when one can go barefoot? So tell me, who’s inspired you to get out of your comfort zone, start a garden or even do something daring? Asparagus simply roasted with kosher salt and pepper is one of my favorite things. Thanks for stopping by! Was excited when u mentioned me in the first sentence. Then… Oh well. My mom was is my inspiration. She used to garden all the time and our house was overrun with plants. Thing is, she was a terrible gardener. Nothing did well. But since she was a doctor she was convinced she can make them better. So those plants we were always overrun with were straggly half dead zombies. Aw, that means your mom had hope, though! Which is almost as good as a green thumb. If the stars align and we are both in Chicago at the same time, you’ll have to give me a tour. THAT would be a post which would most definitely include you (and some awesome food!). I always liked the idea of gardening much more than the actual work. So how is your summer winding up, Rache? My summer’s been crazy and busy and full of change, but not in the good I-went-on-18-vacations way. But all is well now and fall is my favorite season anyway. Thanks, Rache. Sorry about the not-good stuff. And amirite is always in style…the way you do it. Forget the backyard farmer being back. RACHEL IS BACK!!! Yayyyyy!!! Love this story! I don’t do much gardening (that’s why I join a CSA), but each spring my mom, my sister and I go to an herb sale at a local state park and get that basics – basil, rosemary, thyme, sage, parsley. My container herb garden on my back porch is doing amazingly well this year – I’ve been making pesto and herb butters like crazy! I hope you’re freezing those herb butters for later! I like to make a big batch and then freeze them in ice cube trays. I do the same with pesto. I agree with you–I have a CSA so this year I didn’t have a garden but when I go to John’s I am so inspired by all he’s accomplished. He could feed a few families plus on what he grows. It’s amazing! My ex-wife and I were incompatible in multiple ways (obviously, or we’d still be married! ), but we were definitely compatible in the food department. I **really** miss our backyard, which was half xeriscaped flower garden, and half food. All organic of course. Hundreds of pounds of amazing food each year Sigh. So who inspired me? I’d say we inspired each other. Hopefully I’ll have something similar again someday. You’ll find a gardening parter, for sure, Kevin! Sounds like you’ve got some gardening skills. Ah, John. I missed him! Your writing + the asparagus + pictures = love poem. Hang on! Do you hear that? It’s haiku o’clock!! That haiku is brilliant, JD. This post brought back memories. I used to have a gigantic veggie garden back in my 20s. 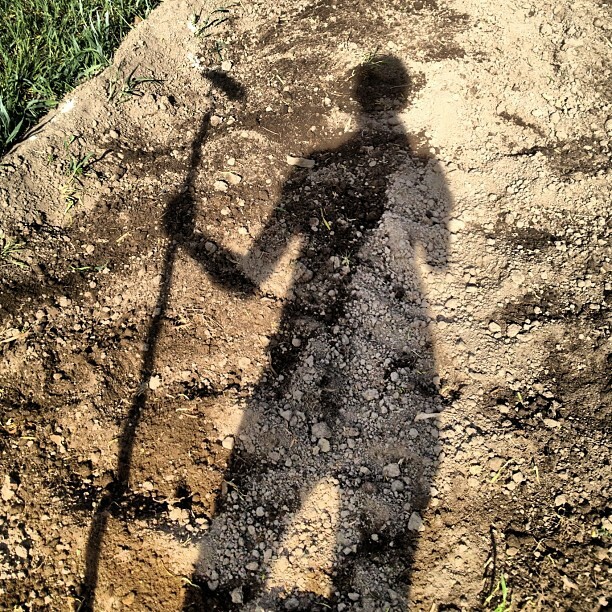 I’d spend hours working the soil, getting good and dirty, breathing in the earthy air and watching all my work produce beautiful food. Sigh. There is such peace in that, isn’t there? So…what’s stopping you now? Snow?? Peace indeed. There really is such peace in gardening. 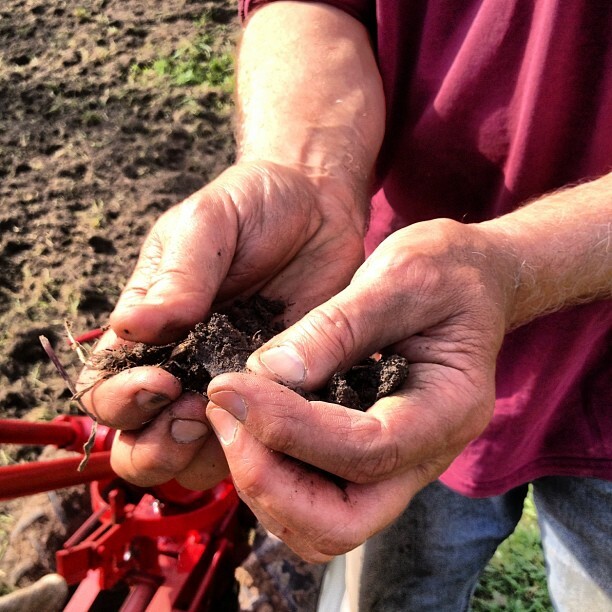 Your mind concentrates on just the soil and whatever it is you’re harvesting or planting. Then you are rewarded with beautiful veggies for your hard work. Feels great doesn’t it? Now you know why I’m always outside playing in the dirt. Cheers! You got it right, Shannon! The dirt is where it’s at! Rachel’s visit with John the farmer is so interesting. The photos are exceptional.